The many demands of the world in this era have turned everyone into very busy individuals. With so much to fit into a 24 hour schedule, most people find themselves seated at work for at least 8 hours a day, leading to a great need of comfortable seats that will protect one from backaches, neck pains and other kinds pains associated with poor sitting posture. Most of such seats are so expensive making it a daunting task finding a budget seat with user-friendly features. 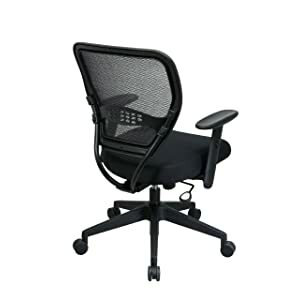 For anyone searching for a more affordable seat, the Office Star 5500 Space Air-Grid Mid-Back Swivel Chair is the product of choice. With dimensions of 20.5 by 19.5 by 42 Inches, adjustable seat and back angle and soft polyurethane padded arm rests, you stand to enjoy premium comfort from this seat. Have a look at its features, pros, cons and what others have to say about this wonderful product from Office Star. This chair’s back rest is made with a Breathable Air Grid mesh that makes it strong and sturdy enough for back and neck support during seated tasks. This ensures that your back is well and comfortably supported while you are seated thus reducing the risk of developing back pains and other problems related to poor sitting posture. 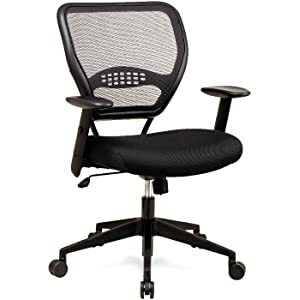 For an even more comfortable feel while seated, the Office Star 5500 Space Air-Grid Mid-Back Swivel Chair’s arms are equipped with soft polyurethane pads where your arms rest. These support and cushion your arms as you perform seated tasks such as typing, writing and working on your computer. The height of the arms is also adjustable to provide better support to the arms. This feature makes it possible for the user to easily tilt or adjust the seat and back angle for maximum comfort. This feature is located underneath the seat and can perform both of these functions with great ease so as to achieve the perfect sitting position for whatever task in progress. This product’s swivel feature allows the user to turn around the office and pick things within their radius with so much ease. For instance, the user does not need to stand or strain to pick whatever is at the back; the user only needs to rotate in a sitting position. This helps make work around the office or work station much easier and faster. This office seat is made with wheels for each of its legs. These make it easier to move this seat around without causing scratches or damage on the floor, especially on carpeted floors. For use on other floors, there are alternative casters available to meet the user’s varied needs. This seat is sizable and wide enough for comfortable sitting. It offers enough room for movement whenever fatigue crops in and whenever you need to adjust your posture a little. Its 41.6 Pounds weight is also quite little for this kind of seat thus an added advantage in terms of portability. With a good number of top-notch features, this seat has managed to gain fame for the great comfort it offers. Its Breathable Air Grid mesh backrest offers great support for the back while its soft polyurethane padded arms cushion and support the arms. This is a wonderful choice for anyone in need of comfort on a budget. Any seat that offers adjustability is usually a great pick for anyone as it can be customized to anyone’s needs. This seat’s height is adjustable thus can cater for both tall and short users. Its arm height can also be adjusted. It features a 2-in-1 synchro-tilt feature that allows for adjustment of the seat and back angle so as to achieve maximum comfort. With its sitting area measuring 20.5 Inches wide and 19.5 Inches deep, this seat provides adequate space for most people. For an average sized user, there is usually enough room for slight movement and changes in posture. With its customized casters, this chair can be easily wheeled around the office during cleaning or rearrangement. Unlike other seats without wheels, this chair will be moved around with great ease without causing damage to the floors or carpets. It also has a weight of just 41.6 Pounds thus can be easily carried or moved around. This seat does not come with overly complicated parts. It is easy to set up in less than 15 minutes as it requires no extra tools and its parts are well labeled to avoid confusion. It also comes with detailed set-up instructions that will guide you step by step during this process. Some users have raised a complaint about its arms not being able to adjust in and out. Its arms are only adjustable in terms of their height hence for plus-size users, it may be quite a challenge using this chair. Office Star has found so much fame from the high quality of office furniture it produces. With great features that can only be found in the most expensive office chairs, the Office Star 5500 Space Air-Grid Mid-Back Swivel Chair enjoys the top position of the highly rated and recommended seats. It is actually a perfect pick for anyone who wants the desired comfort without breaking the bank.